Every year the New York Public Library publishes a list of 100 books that their librarians feel are the best of the best for kids. Here is a link to the New York Public Library's website with the 2017 list for kids books.opens a new window There is also a link to the list of books they recommend for teens and you can link to previous years' lists. The St. Tammany Parish Library is proud to say that we have most of these booksopens a new window, or have them on order. Some of the titles may not show up in our catalog just yet, the ordering process is a little complicated. If you see a book that is just right for you and you do not see it in our catalog, please submit a Bookbuyer Requestopens a new window and I will certainly consider purchasing it for STPL. And, speaking of the New York Public Library! I was lucky enough to visit New York City with my family over Thanksgiving break. Of course I visited the New York Public Library's most famous branch, called the Stephen A. Schwarzman Buildingopens a new window. After saying hello to Patience and Fortitude, who both sported festive wreaths for the holidays, and admiring the tall and beautifully decorated Christmas tree in the lobby, I visited the children's room. 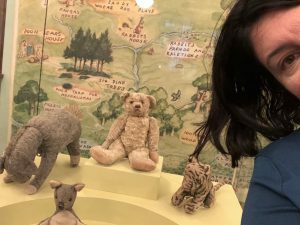 Imagine in the middle of a functioning children's library, with storytime going on in the next room, having some of the most famous toys in the world! I've loved Winnie the Pooh and his friends from A. A. Milne's classic books since I was a small child. 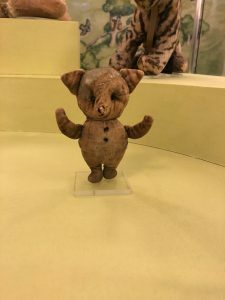 The original stuffed animals that inspired the stories are on display in the children's room at the Schwarzman Building.